"Application performance monitoring for web applications"
"Reduced MTTR & increased MTBF!!" "Helps me to control in a more efficient way the apps"
I like AppDynamics very much because it helps me to control in a more efficient way the apps that I am deplegating in the cloud, it offers detailed data, it has a light load of the server, it helps to find errors easily and it constantly monitors the stability and the performance of the apps. The cost is the main problem encountered by users of this software so be careful and use it as strictly necessary. It has helped me to find almost imperceptible errors, the best part of this software is the analysis capability it offers. I have more than 40 apps deployed and another 15 in development, so I need AppDynamics to help me find the weaknesses of my work, has an interface with a very intuitive design that greatly simplifies its use, is test approach is very effective, in addition to identifying the problem helps me find the source to correct it. What Application Performance Monitoring (APM) solution do you use? "One of the best APM tools in the market"
Disclaimer: We are in the evaluation process. As part of the evaluation, we've been able to test out a few tools on the market and AppD stood out the best. The best part of AppD is the presentation of the info it gathers. It aggregates the relevant info into a single flow and presents it in a tab with the ability to drill down further. It is most helpful in presenting it to the management as we go thru' the evaluation process. There is a bit of learning curve to get the hang of the tools features as it has a lot of them. Also perhaps the pricing is a bit on the high side when you have several hundreds of servers to monitor. Our application is very data intensive and straight out of the box, AppD was able to pinpont some pain points we hadnt noticed. Certain queries that required optimization as they were being called several million times, essentially doing a lot of I/O on the DB server. "It's a good tool (for pre-production stages) but not relevant for problem solving"
- A lot of information about your system is provided, performance wise. - Clean and intuitive interface and allows users to get information with just one glance. - One good thing about this is that the community is growing into a sizeable amount. you are able to find tutorials on the net easily. - Weird bugs which annoys my development team - sometimes it works, sometimes it doesnt?? - It requires major planning prior to implementation - if you are already on production environment, this will require you to tear down your existing infrastructure. For current systems which are already live, implementing this may be a hassle and chore. Recommended for those who are interested in monitoring their new systems, with regards to performance, to use this instead. We are trying to monitor the performance of our new system and streamline processes which potentially can help our staff do their work with better efficiency.
" Baik diguna untuk semua! " Korelasi masalah Pengalaman Pengguna dengan transaksi bisnis ke tingkat permintaan basis data adalah fitur yang sangat kuat. Banyak integrasi dan ekstensi yang tersedia. Komunitas AppDynamics memiliki basis pengguna yang besar dan bersemangat, serta pembaruan, perbaikan, dan dukungan dari AppDynamics sangat baik. Ini juga salah satu sistem di mana kita dapat mengkonfigurasi banyak. Jika Anda dapat memiliki uang maka Anda harus melakukannya. Ini dapat diintegrasikan dan mudah digunakan. Manfaatkan versi uji coba gratis dan dukungan teknisnya untuk memahami sepenuhnya bagaimana itu dapat menguntungkan bisnis anda. Alat yang sangat efisien untuk memantau sumber daya infrastruktur, permintaan basis data, laporan kesalahan dan ketersediaan juga sangat berguna bagi administrator dan pengguna sistem. "Excellent APM to monitor performance"
I used both the leading APM tools; I love the following features in AppDynamics which expedites the performance bottleneck detection: real-time monitoring both transactions and end-user monitoring, host health metrics, code-level detection, and intuitive performance reports. AppDynamics supports all the major technology stacks (end to end) which is a great advantage and also, the alerts, health rules, email/SMS integration is simple to use and it requires less expertise to manage. AppDynamics community has a huge user base and vibrant and the updates, fixes, and support from AppDynamics are excellent. Pricing. To sign-up, it is must to have an email address. Only 14-days pro-trial for SaaS which can be increased to 60 days. 15 days trial for the AppDynamics Pro which also can be increased to 60 days. There is no lifetime personal license available in AppDynamics. There are other APM tools like New Relic, Stackify, Riverbed, etc are available if you are looking for a budget solution. We execute various types of performance testing such load testing, stress testing, endurance testing and spike testing on daily basis in various environment. It was tough to detect and monitor the performance issues for each type of performance testing. But using AppDynamics, it is possible to create a trend in bottleneck detection. When the performance testing projects integrated with CI/CD pipeline, then AppDynamics plugin helps a lot e.g. if there is a performance degradation, it allows the job to be failed. The .NET and Java agents hide incredible amounts of additional monitoring capabilities not enabled by default. Given a fair level of autonomy a senior administrator would help any company realize an unparalleled level of visibility and reactivity. The Server Visibility is just what an Ops team needs. Clean, effective, data-center-wide visibility on CPU, RAM, DISK, and NETWORK. All cleanly cut up into individual tabs. You can work on a hybrid solution leaving the gathering of critical intel to occur within your own server hardware and the resource heavy EUM to occur on AppD hardware over a secure connection. Having more visibility faster than even our data center hosts have it. The entire 24x7 support staff knows their craft and are effective at resolution response. The new logo looks great, this is important when you put your tool belt utility labels on your public site. AppDynamics is highly configurable for "actions" which include alerts and actions. There is no direct dial for support. I've been stuck playing email tag to get to a GTM going during a critical outage. Support is usually very responsive, but with all the alarms and whistles during mission critical outage I want clear connectivity to support, and a direct link to a GTM 5 minutes ago. The database tools are a bit lacking in the 4.3 version and don't seem to have been improved that much leading into 4.4. You still get a really good level of "add-on" visibility to a tool such as Redgate. However, I wouldn't consider this a "one stop platform shop" until the database visibility improves greatly. Large companies need to realize that the administration of AppDynamics is at least 1 full time job. Some of the ability to configure when paired with a large environment can cause you the need to revert changes and re-configure to avoid confusion. Do not think that this application will solve your problems if you are not willing to invest the appropriate time and resources into it. Invest in training a local asset and have them work with the services group to properly implement. Appdynamics is well worth the money for the software if you have the money to support it internally as well. Almost all installations > 20 agents take a full time asset with Admin privileges in your environments. Expect great things from this company in the near and distant future. We have realized far greater visibility and mobility as an Operations team. We have been able to double our product footprint without increasing our staff and without overloading them either. Lastly, we were able to boost the "signal to noise" ratio on our alerting strategies and script out automated responses during out of office hours. "Controle Total sobre Infraestrutura e Aplicações"
AppDynamics tem uma interface simples e intuitiva, simplificando e tornando o trabalho mais produtivo para ambos os ambientes de usuários e administradores do sistema. O sistema oferece uma grande quantidade de informações úteis a disposição do usuário. Ações como monitoramento da infraestrutura e aplicações em produção suportam com eficiência os administradores a manter os serviços sempre disponíveis, principalmente aqueles com processos críticos. O processo de integração seja é um pouco complexo, mesmo com o suporte de especialistas e materiais disponíveis, ainda mais levando em consideração o tempo disponível para uso de testes. Avalie quais são suas necessidade e como as Ferramenta poderá ajudá-lo antes de sua implementação no nível de testes. Se bem implementadas, os resultados serão visíveis para todos os envolvidos no processo. Existe uma grande e crescente comunidade de suporte que é com certeza um ótimo recurso de apoio nessa jornada. Ferramenta muito eficiente no monitoramento dos recursos de infraestrutura, consulta em base de dados, relatórios de falhas e disponibilidade também são muito úteis para os administradores e usuários do sistema. "AppDynamics es un programa muy útil"
AppDynamics es una herramienta muy buena y usamos el APM para monitorear gran parte de los rendimientos de nuestros sistemas. Poder personalizar el panel fue un punto a favor y me permitió configurarlo de la forma que prefiero. Nos gusta AppDynamics por su solución altamente configurable y su capacidad para ser compatible con las principales pilas de tecnología, lo que es beneficioso para nosotros. Muy satisfecho con el soporte técnico proporcionado por AppDynamics ya que son receptivos y están bien informados. Sus frecuentes actualizaciones y arreglos también son excelentes, demostrando que escuchan a los usuarios. A pesar de la fácil implementación de AppDynamics y de la suficiente documentación disponible, las documentaciones a veces son confusas y requieren un tiempo para comprenderla. AppDynamics además es muy caro. Aproveche al máximo la versión de prueba gratuita y su soporte técnico para comprender completamente cómo puede beneficiar a su empresa. Sin embargo, si está buscando una solución de presupuesto, sería mejor que busque otra cosa. Al usar AppDynamics, podemos monitorear nuestros sistemas y realizar varias pruebas de esfuerzo para tamizar el punto de estrangulamiento y rectificarlos y mejorar nuestra eficiencia. "Great features, they thought of everything"
Unified Monitoring rolls several products into one platform, which makes for robust solutions. The UI is perfected. Website monitoring is made more efficient with AppDynamics. Support is average to good. It is a robust, ROBUST product but this has its drawbacks as well. Robust tool usually means a steep learning curve and AppDynamics is no exception. Implementation has been a challenge. The current version is also buggy. Try out solutions that don't require a full replacement of existing infrastructure first. If you are in need of a robust solution that will probably improve - removing bugs, increasing support, etc. - in the next few years, you might be willing to grow with AppDynamics. We are not. Seeking efficiency with a new infrastructure for website monitoring. If it weren't for the bugs and issues with implementation, this would be a perfect solution for us. We will probably seek another option. "Easy adaptation, easy monitoring at one glance"
AppDynamics is a very good tool and we use the APM to monitor much of our systems performances. Being able to customize the dashboard was a plus point to me and allowed me to configure it to the way i prefer. We like AppDynamics for its highly configurable solution and ability to supports all the major technology stacks which is a beneficial to us. Very satisfied with the tech support provided by AppDynamics as they are responsive and knowledgeable. Their frequent updates and fixes are excellent too, showing that they listen to the users. Despite the easy implementation of AppDynamics and the sufficient documentations available, the documentations are at times, confusing and require some time to fully understand. The pricing of AppDynamics is on the steep side as well. Make full use of the free trial and their tech support to fully understand how it can benefit your company. However, if you are looking for a budget solution, you would be better off looking for something else. Using App Dynamics, we are able to monitor our systems and conduct various stress test to sieve out the choke point and rectify them and improve our efficiency. It’s a tool that offers seamless traceability and a view that bridge both the APM and the Business product usage effectively.. Different people can interpret this definition differently so this article attempts to qualify what APM is, what it includes, and why it is important to your business. If you are going to take control of the performance of your applications, then it is important that you understand what you want to measure and how you want to interpret it in the context of your business. The problem is that none of the server monitoring tools are capable of knowing how your applications are performing. Some of them can probe your application to see if it is available or not but none can tell you why your application has ceased to function. "Excellent Monitoring Tool, Implement and Enjoy!" Integration is very much complex. We cann't implement internally as required complete hand on training with expects. Additionally, integration with Oracle on source code need to implement in future as . this will required what support department objective and goals. this will help to achieve their KPI on write directions. Support issue and identifying the actual issue ,as we are the large organization with have multiples domains, and every domains have their work loads., this application help them to identity the error root for rapid fixation. "AppDynamics : WebApplication for Performance Monitoring and Identifying Performance bottlenecks "
AppDynamics help to visualize the entire business flow in a details .All the databases, infrastructure ,front end data flow and connections are all captured will metrics like load time ,network IO ,etc.Its gives details metrics on each layer for further analyze and pin point any performance bottlenecks . This is one of the leading products in market that is helping solving multiple performance issues.Its easy to provide client side as well as server side performance. The only disadvantage i feel being a developer is the cost of AppDynamics License.It only provides 1 month free trial . My company has started using AppDynamics alongs with Dynatrace and planning to move `to App Dynamics because of its capability. AppDynamics is helping many application identifying the performance issues and bottlenecks so that they can be fixed to improve application performance , reduce resource utilization and memory leaks which in-turn provides cost benefit to the organizations and customer satisfaction. "Lots of features with simple deployment"
Simple deployment with standard agents. It's very easy to develop new extensions with the machine agent. Requires some understanding of the application server to deploy. Very intuitive metrics browser and dashboard creation is super simple. You can view the full application and resources state during a snapshot. User and developer support is good. No very friendly debugging. The logs are very cryptic some times. The metrics collector server requires a lot of resources. The trial last for 15 days which is more than enough to diagnose your application performance and possible errors or do some fine tuning. Application mapping with connections to external systems (databases, web services, etc.). In-depth application resource usage and performance. "Appd Awesome unique and amazing"
This monitoring tool is awesome in use , It monitors all the traffice and influx transactions going in and out of the system, it also used agent to feed in live data to the app dyanamics cloud machines which can be opened anywhere in the system. This monitoring tool is awesome in use , It monitors all the traffice and influx transactions going in and out of the system, it also used agent to feed in live data to the app dyanamics cloud machines which can be opened anywhere in the system.It gives lot of good capabilty to monitor and view heavy hitting traffic calls and also good capability to see Database queries and you can catch those to tune it. It makes Saas so easy. It has best tools in industry.It make analysis super easy. All of my work was cut in half. very high efficiency.It allows in Depth of monitoring into Web applications and infrastructure is peerless. Complete suite of business-focused analytics, dashboards, reporting, and alerts for business users and IT professionals. Make sure to include all areas of those in your IT department that could have a use for the product sooner in the process. It can help them to buy in earlier and see all of the benefits that it can allow for. Different areas of IT can definintly benefit from the tool. In our environment, appdynamics is deployed in the jvm. There is minimal overhead. The GUI provides resource usage graphing and call chains with identified errors/exceptions. I don’t think our company uses it to its fullest potential. It would take a lot of setup to get it fully running from what I can tell. Especially building all of your Business Transaction rules. Sometimes the scope of the automated monitoring frequency doesn't capture full traces of the exact transaction you are looking for but the collective results get you what you need. Again this may be something we have not utilized, but it would be interesting to get reports of all the exceptions over a week's time. Work with the AppDynamics team closely; they will help set it up, train your teams, and ensure you are off to a great start. Should anything arise during your deployment they will be there to help you along. Monitoring heap usage, garbage collections and their timings, and handling exceptions. This is specifically used in our environment as an after-the-alarm tool, but it can be configured to perform the alarming itself. "Appdynamics gets all the tiny insights needed for your application "
we use app dynamics for monitoring and alerting of our web applications in real time . The best thing about appdynamics is that you install an agent and it pulls all the needed insight itself from server load , to application load to slow and stuck business transaction . You can drill down as deeper as you want and can set alerting on health rule violation which is analayzed by trend of your application . The onething i dislike is it is quite expensive and we always run out and max out the number of nodes which cause limit reached . For me the best thing is the amount of control you have over the information that is displayed. You can really dial down the specific parameters you want to visibly monitor in real time. This can help you assess any situation quickly and effectively. AppDynamics is a massive time saver, and reported issues with an app can be easily located and they can be solved so much quicker than previously. You can filter out parameters that you already know won't be an issue and get right to the cause. The interface can be a little bit clunky at times and I think it could do with a bit of optimization. There are so many options available when using it it can slow it down a little. This app can really help cut down the time it takes to find the cause of an issue. If you are finding yourself taking alot of time looking for the root of a reported problem and less time solving it then this will go a long way to making sure that doesn't happen. We are using app dynamics to easy monitor all the apps our company uses in one place. The fact you can customize the what data is being reported means you can easily monitor exactly what you want to. This can save a massive amount of time by cutting out any information you have no desire to look at. The support available for developers is brilliant and the fact that support is available 24 hours is really worth while. The interface looks great and makes it easy to access all the information you need just from glancing at the screen. It is so easy to have it open on one monitor and look periodically without having to dive deep in to the program to run just a few checks. The reporting that App Dynamics provides has really cut down the amount of time we take troubleshooting an app issue. While monitoring it can help us spot an issue early when our systems are working hard and we can react to this before it causes any damage. The price of it is quite high so you have to be sure that this suits your needs before investing. Although the price is to be expected for what you get. Set up does take a while to complete but this is because the program is so in depth. A streamlining of this process would be beneficial to any business but this should not sacrifice the depth of the program. For anyone looking to monitor multiply applications and produce real time reports then this does the job. It can help you react to arising issues before they have the chance to happen. Monitoring in real time on a cloud based platform means you are no longer limited to your office. You have freedom while maintaining control. It also helps us collate an overview of how all our applications are performing across the whole business. "Real Time Snapshot: Right Here, Right Now!" This software is really easy to use and understand! AppD afforded us the opportunity to view the entire text of our queries, and the response times for the slower queries. This way we could easily locate which queries were causing a slower functional response to our applications.
. We’ve only used it during a trial session/period however once we have more usage, we can provide a more accurate response. For now, some colleagues have reported that it can be more complicated than necessary, but that has not been my experience so far. Give it a try - you can't go wrong! We were able to accurately isolate which queries to optimize and ensure that the changes we made indeed addressed the issue in question, allowing us to concentrate on the application functions that are central to our business. We used it to explore real-time visibility of customer experience. "Best Performance and Monitoring Tools"
Very good for monitor the system's perfomance. Through the customized dashboards and panels is possible to keep attention on what is really important to the business supporting all aspects to garantee the critical applications area always available. Would be very helpful if a more time free version than we could have more time to use and make some tests on the tools available. The installation processos is not so easy. I thing in there almost all department tha have used IT resources can be benefits with the tools provides. Mapping correctly where and how to correctly use will make your day more productive and profitable. Great to connect to a lot of types and sources databases. Monitor tools are specially helpful generating great reaports. "App Dynamics saved us time"
App Dynamics help us identify slow traffic on our mobile app down to the node that was causing the issue. We re also able to create dashboards to use that help us translate performance to the business so they have a picture of what is happening. I can honestly say there is noting I dislike about App Dynamics. Every day it helps us learn more and become proactive as opposed to reactive. We recently had an issue where customers on our mobile app where having a poor user experience. With App Dynamics, we were able to see the transaction that was causing latency and trace it back to a DB issue. Without that, we would have to search for hours instead of minutes. "Great tool for monitoring and maintaining SLA"
AppDynamics is a great monitoring tool and the alerts and dashboards helps us monitor our servers and helps filter response codes, even business team with minimal technical knowledge can open the dashboards and see our application performance, besides that it will send alerts to our mailing group which are very useful. The toplogy created by communication amongst our servers/Databases helps to understand the traffic flow. The drilldown capability helps track down the nodes levels and see the JVM errors/exceptions. Learning curve and more tutorials need to be created for beginners. Start using AppDynamics and you will love the capabilities it brings to your organization. The most I like about this tool is it's interactive, simplistic and provides you with any application data you can think of. The way it presents BTs and Metrics and Dashboards is amazing. It is heavy, and requires lots of server resources when monitoring multiple applications. Also, reporting is not great but the vendors are still working on improving it. Really great product. Would make your life easier. We are enrolling AppDynamics into the whole Wells Fargo environment. Creating major and important application dashboards and viewing them at a glance and figuring out the issues application is facing resolves the time issues in case issue arises. Plus alerting system in AppDynamics is great too which alerts in case of any crashes. "Expensive but wow... the insight is worth it." $$$ way too expensive for 90% of Corps..
Pricing is incredibly wrong. Only large corps can afford it. And many and up using Nw Relc which is a shame as this product is far superior and provides PRODUCTION APM and Monitoring. This product will dispel the myth that Engineers “know” i.e. Guess where performance problems are. It can show granular transaction costs down to SQL query plans. It integrates easily with JEE, JDBC drivers and JMS APIs using its own Aspect-oriented byte code rewriting. ALL while in production. Yes, this product is ran on production machines. One can trace actual business logic bottle necks on the real system without a significant performance* hit. The performance gains from fixing the bottlenecks far out weights the 2% degradation of using this product. One can obtain exponential gains once it’s clear where the real performance issues are and not guesses. As a support engineer, AppDynamics is one of my daily tools that I cannot leave it. Especially for analyze production issues. For example, some sql query running very slow but I dont' know which one exactly. With the help of AppDynamics, I can filter out the long time request from end user, then analyze these bad performance requests to find out the sql performance issue. It's a bit slow when you're navigating on the page. AppDynamics should improve its performance. There are lots of functions on AppDynamics, you need a formal training or someone is very experienced to guide you. If you're the first time to use it, you probably lost on the page because there're too many UIs on the page. AppDynamics is a very powerful tools to monitor your distribute system. It's easy to use and has a very simplicity UI. You can find the functions what you need quickly. Sometimes, out customer said they encountered a very bad performance issue on our product. With the help of AppDynamics, we can quickly find out which request was slow. AppDynamics save our much time to looking for issue cause. Besides, its alert function is very useful. There probably have hundreds or thousands servers running in your house, AppDynamics will alert you if one node is down. Lastly, it's verify convenient to restart a batch of servers from AppDynamics. Yep, it saved you much time. "Great Product - Easy to setup and use"
The best thing about AppDynamics is it is very easy to setup and configure, with some good experience about softwares and servers in general, a user can be up and ready to use AppDynamics within 30 minutes. The out of the box features allow you to quickly view a lot of data about your application which you do not have access to otherwise. A better user experience can be provided on the dashboard creation. From my experience you can create great dashboards but then a user creating the dashboard should be well versed with the tool as well as know details about their own application in order to create a impressive dashboard. Some of the custom metric widgets on dashboards are not that email friendly and can be enhanced to provide a better configuration ability. We are mainly looking for bottlenecks within our application and trying to identify the most expensive backend calls. Currently we are mainly doing out of the box monitoring that is available and plan to increase and improve it in the next few months. "Very user friendly APM tool with great analytics"
Easy intuitive UI with BiQ/Analytics is certainly a great value add for this unified monitoring solution. The deep dive diagnostic capabilities what AppD offers is simply the best considering the fact it covers the complete stack (APM, database monitoring, Browser/Mobile End User Monitoring, Infrastructure/server level monitoring, network) as well as the ability to monitor the latest technologies in the market via AppD extensions. No centralized license management server - we have multiple instances of AppD set up onpremise but then due to the absence of centralized AppD license management server, we had to shuffle/swap the licenses as per our need and we need to apply individually on those on-premise instance. Identifying bottlenecks on what is causing the Application slowness or error is is the problem that we intend to use AppD for, which is no longer a time consuming task with AppD's snapshot functionality which also auto suggests the potential issues. Integration with multiple frameworks (Java, NodeJS, .NET, etc). Good database monitoring tool as well as end-user and synthetic user monitoring tool. Works great for on-premise and is always maturing and keeping up with industry trends. It's been in Garter's Leader Quad for years now. SaaS is developed prior, then on-premise. We have reasons to need all of it on premise. They stay in step pretty well, and will fulfill promises to deliver. We didn't know where the slow-downs were happening. The up/down way of monitoring wasn't enough for us, so the slowness, machine learning and baselining was really nice. Seeing user experience was also very helpful. "Our helper from the last two years!!" The trouble shooting in production environment is a breeze with Appdynamics!! We have brought lot of stability to the production environment only with Appdynamics' help and its reporting. We have our annual client events where the system comes under load. Appdynamics provides a perfect insight into the load the system is in during those events helping us to be very proactive. 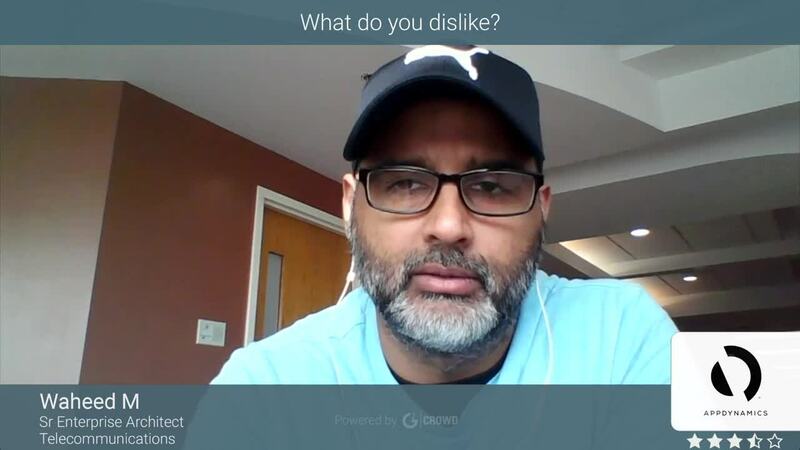 Appdynamics exceeds expectations in what it promises. It does not promise a code debug kind of feature. But if it ever did, that would be an icing on the cake. As mentioned above, its been an extreme help on production troubleshooting. The errors it has been able to provide insight into has helped us bring a lot of stability to our product. It continues to do so release after release. Being able to see quickly what is going on for any set of servers is crucial to supporting our applications. There is a lot of things that can be configured to improve the monitoring. It is hard to know how deep we need to go to get the most out of the tool. Improved application performance by being able to see where the code and database issues are. We have used AppDynamics many times in diagnosing specific performance problems and resolved them due to the output it provides. Seeing problem trends before they become user problems is another benefit we've been able to realize. I like the real time transaction monitoring feature and the various dashboards it provides out of the box. You can track a transaction from end to end. If your transaction passes through multiple services and databases, it shows all the components on the dashboard and then you can click on any component and view the details. You can monitor CPU, memory etc. It lets you setup email alerts. It also shows the errors and exceptions in the system. It is a complete monitoring software. Nothing that I can think of. It has all the features we need. If you need a really good APM software, then this is it. It can help in detecting issues, as soon as they occur. It also shows you the exceptions and the component/service which is having problem, so it does the 'detection' part and your job becomes easier. It has everything that you would need in an APM software. You can track your transactions end to end. We are using it for application end to end monitoring. We have various email alerts setup on CPU, memory, exceptions etc. We use it for production monitoring and have been able to catch issues as early as possible. "Am impressive product that gives the ability to monitor, analyze, and understand your IT operations"
-The ability to see services on the lowest possible level as well as the highest level, interacting with the rest of the estate. -Very light server load, less than 1% additional CPU load on every monitored host. Consider your IT estate carefully and try to limit the potential AppDynamics userbase to those who really need to use it as otherwise costs can swiftly spiral out of control. Definitely try the trial with them, they are extremely responsive and accommodating with potential customers. AppDynamics allow us to monitor the interaction between component services and applications in a solution stack, between discrete solutions interacting via the middleware with each other and MI reporting solutions, and all the external customer interactions hitting gateways and application servers on a unprecedented breadth and depth. The utility is immensely helpful for monitoring performance, finding problem spots, and diagnosing errors and significant performance hits. It gave me in good, fast and relaible insights of your system in real time. I mostly used it for application performance monitoring (APM) that's where it shines. User interface is good.i loved it's alerts and email and sms integration can be managed by total beginner. It is basically overkill for small business and it is a very pricey solution. As cisco acquired I expect there would be better choices for small business and better cost efficiency .trial period was too small for someone to truly know if they want it or not. If you are going to try it in trial persiod , try to make most us eof that time and make a good decision because trial is very small. Although product is totally worth it if you have a big business . On regular basis I did stress testing ,load testeing and performance testing to monitor our applications.i was able to do twice as much work without increasing the staff which was very cost efficient for my employer. "A Good Monitoring Tool With A Few Downfalls"
The Presentation of the graphs and data is one of the positives of appDynamics. It is a very reliable monitoring tool. It reaches down to a very low level of the code to let us know a problem for a high response time, or in other words, it gives us in depth analysis of issues. The price is one of the drawbacks. It is very expensive. Personally it took quite a bit of time to get used to the software, to know where to look for specific information on monitoring. Very intuitive. As vague as this sounds, it just seems to work. Whether it be developing custom dashboards or creating fresh extensions. I personally enjoy how easy how easy and simple it is to monitor resources state at a glance. It works with our current set up. The one problem i have with this software is simply, how logs are processed and displayed. I've had to create multiple briefs for my department, just because the majority of employees aren't grasping it. Its taken up more time than i'm happy with. But apart from that, happy user. Straight off the bat, we use AppDynamics for company-wide monitoring of all apps. Essentially we realised how outdated our previous systems were. Everything was fragmented and a chore to use, but with AD, its all together, working in tandem. After the initial period of getting our staff into the swing of things, it has begun to save us a massive amount of effort. To find out the root cause of performance issues. "AppDynamics is Taking APM to the Board Room"
AppD allows our organization to drive fundamental changes throughout our organization. We're better understanding how we and our customers utilize and drive revenue, and ultimately digital transformation through their apps. There is little to dislike. The one aspect of AppD that I would request is to increase the speed of integration. The more tools, platform, and data sources that AppD can pick up, the better and richer the data becomes. Explain the true business value of the product not just the tech benefits. Ultimately we got started with AppD because MTTR was affecting our customers. We're now moving into helping our customers understand their operation even more; how their customers purchase, how revenue is affected by outages, and ultimately, how we leverage AI to better anticipate outages and changes. "This is our lifeline when it comes to knowing our platforms performance." I like that I can easily dig into an issue visually. We can find out down to the little detail what is causing a problem and deploy a fix. The support is very poor. Many times we have answered our own questions before an initial response. A lot of the times we also get an answer like, you are not able to do that at this time. Real time monitoring and troubleshooting. I like that my team can quickly identify which node member in our cluster is struggling and identify what the transaction is that is running poorly, and immediately have some actions to take, or talk with the appropriate group who can address the issue. It is pretty expensive per JVM, so we really have to make a decision as to which servers to monitor. Great tool, very useful features that normal "monitoring" software does not have. Our main problem is to troubleshoot poorly running JVMs, which can be very difficult to troubleshoot what is going on. AppDynamics has helped us quickly identify slow running queries and denial of service attacks. "App Dynamics my best software 2018"
"appd for checking server or application performance"
I like how the App Dynamics provides a diagrammatic view of the application as well all the components connected to the application. It gives a straight forward view of the app's performance & also other components performance in one view. Performance monitoring for servers & applications. "Great Modern Monitoring Tool! " Ease of use for end users, new dashboards and reports can be generated quickly and easily. Provides deep insights with minimal customization. Agent Deployment and management could be a simpler process. AppDynamics has been able to help identify issues and their root causes on our customer facing website. "A indispensable application monitoring tool for any enterprise"
Dashboards are easy to create and folks are able to point out potential problems easily. Not much of an overhead , but its been able to provide reasonable amount of insights in to how the environment is behaving. Its not able to trace all outgoing calls accurately, its work in progress. But given where we were appdynamics is a lifesaver. ensure optimal settings while installing to ensure that it doesnt add too much of overhead. Its advisable to restrict access, else many people will have opinions on what is going wrong and how to fix it. Especially keep it away from management, other wise your dev team is going to spend lot of time explaining why things work in a particular way. "Using AppDynamic as an APM for a web based membership survey application"
That is only takes a sampling of transactions making it impossible to use as a tool to troubleshoot a particular user experience. Also their support of deployment and ongoing support has been a problem. We were hoping to leverage the tool to isolate user experience issues but found that it really could not do that, at lease in their SAAS offering. Perhaps an on prem deployment might have been a better choice. This software has good integration with a number of different frameworks, this includes JAVA. The dashboard is aesthetically good has lots of capabilities, can't forget the ability to view problems in real time - that's a great advantage. For example, if your application fails to function as usual the software can not detect why, it can only see how they are performing and check if it is available or not. It helps quickly identify problems so that the impact can be minimized before it reaches the customer. This is the best for APM, cloud monitoring especially with a large business. * We monitor all AppDynamics reviews to prevent fraudulent reviews and keep review quality high. We do not post reviews by company employees or direct competitors. Validated reviews require the user to submit a screenshot of the product containing their user ID, in order to verify a user is an actual user of the product. Hi there! Are you looking to implement a solution like AppDynamics?